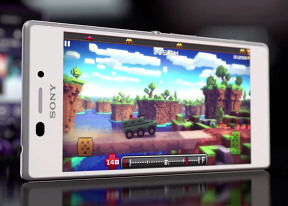 Sony Xperia M2 is running on the Snapdragon 400 mid-range chipset. It offers four Cortex-A7 CPU cores, Adreno 305 graphics and 1GB of RAM. We've already seen the S400 in action on the Motorola Moto G, the Sony Xperia T2 Ultra, the HTC Desire 816, the HTC One mini 2 and several others so it's clearly a quite popular choice. And rightfully so as it delivers a snappy performance in everyday use and quite acceptable gaming as well. Starting off with the CPU benchmarks, the Xperia M2 posted an OK result on the multi-core GeekBench 3 cross-platform benchmark. While the score pales in comparison to the latest Krait processors, the Xperia M2 matched the performance of the Moto G and Xperia C and bettered that of the first-gen Krait and Cortex-A9 devices. AnTuTu is a compound benchmark, which also takes into account RAM and GPU performance. The Xperia M2 numbers are quite good, slightly better than the quad-core Cortex-A7-powered Moto G, much better than the Xperia C, but below the Xperia T2 Ultra. Basemark OS II is another all-round benchmark. It gives an overall score along with single, multi-core performance, math performance and more. We focus on the overall score and the dedicated CPU scores. The Sony Xperia M2 overall rating is quite poor, but the singe-core and multi-core performance put it very close to the Snapdragon 400-powered HTC One mini 2. The graphics benchmark results didn't come out peachy. The GFXBench tests - both off-screen and on-screen variants - reflected some very poor performance. It did better on the on-screen tests than the Xperia T2 Ultra, which has the same chipset but packs a higher resolution 720p display. Sony Xperia M2 and its powered Snapdragon 400 chipset offer good overall performance, though the GPU benchmarks are quite uninspiring. What's really matters is real-life usage and it is great. The Android OS is as smooth as butter with no lag whatsoever, while most of the popular games run just fine.